Note: The video on this page is part of a long series because it took a long time to make the sculpture and turn it into a mask. 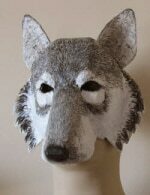 If you’d like a much faster start, check out my downloadable wolf mask pattern. Just print it, cut out the pieces and tape them together. Then you can use the techniques shown in the video series to embellish the mask and add detail, without needing to start from scratch. This is the second video in this series. You can see the first video here. This time I add the eyes and nose, and put on the basic shapes that surround the eye. The sculpture still has a very long ways to go. I do like this guy, and I’ve decided to make a silicone mold for it when it’s done. (I like him a lot better than this wolf I made a silicone mold for last year – I never actually used that mold, because I didn’t like his expression).Â I’m also thinking about doing some experiments with an modified form of the fast-setting paste to see if it’s possible to use layered paper mache inside a negative mold without losing any really fine details. I’m skeptical, so in the end it will probably be made using the “instant paper mache” recipe I used for the cougar and hippo – but it would still be fun to play around with it. 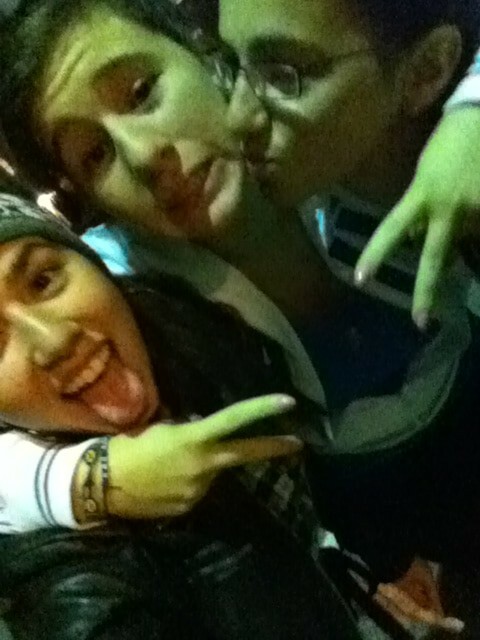 Hi Carmen. The paper mache clay was only used to get the texture on the wolf’s ruff. The actual mask was made using the techniques and recipes that I show in the Pantalone (Comedia del art) mask. You can see the whole process in those three videos = the links are the first ones on the Extended Paper Mache Tutorials page (below the photo of the wolf mask). Hi, i think u r an amazing sculptor, how did u get so good at it?? P.S. I love Wolves. ???? This wolf is really nice. I want to do one. Oh, so many wants so little time. And by the way….Congratulations! Your new book received a great review on Amazon . While stopping by I noticed you are as old moi. I’ve got a birthday rolling around in a couple of weeks. so just wondering between the 2 of us… Who is the oldest???? Thanks, Sharon. I hope your foot got all better – you’re taking good care of yourself, I hope. And, my B’day is on the winter solstice, so I think that makes you older, by just a smidgin. Unless my math is off, which happens quite a lot. Happy birthday, in any case. In this post you mentioned a silicone molding process that you have previously used. I would like to find out more about that process, as I would like to produce a casting of a few of my own pieces. I was curious if the process would permit an affordable polymer replica to be made for resale at a lesser price point in my shows. Robbie, I’ve never done any polymer castings, but I think the silicone would work as a mold material. The best source for information about molds seems to be the Smooth-On company’s website. They have tons of video tutorials. There are also a lot of people out on YouTube who make miniatures, and they might have some videos that would help. I’m not an expert by any means – I’ve only made the two wall masks so far, the cougar and the hippo. And that was using a plaster and cellulose mixture, not polymer. (I am not even quite sure I know what you mean by making a polymer replica – that’s how little I know about this stuff.) The Smooth-on people make the molding and casting materials, so they would be the experts to turn to. I like your site, by the way.